Attendance and behavior are two major factors in improving or impeding access to learning at school. Learn how to integrate your existing attendance process and policy with positive behavior intervention supports (PBIS) to increase positive student behavior and attendance. 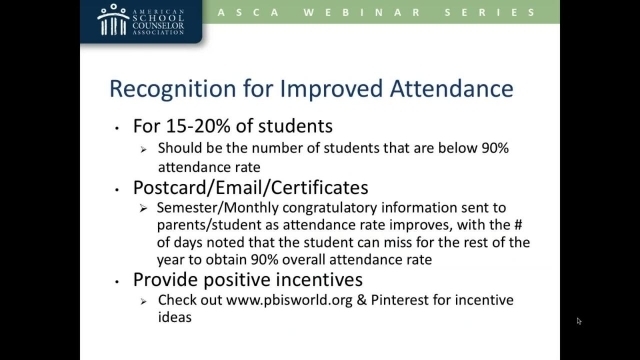 Leave the session with concrete techniques on how to update PBIS and attendance policy and process to improve student success through student contact. Download accompanying handouts. List specific techniques to integrate PBIS with attendance policy and process. Examine similarities between PBIS and attendance policy and recognize how to integrate attendance policy into a tiered system of support. Kathryn Buchan, School Counselor, Buljan Middle School, Roseville, Calif.
Tonia Stallions, School Counselor, Chilton Middle School, Roseville, Calif.